Here are some photographs of the Stanton Williams-designed Hackney Marshes Centre, which provides facilities for London's amateur football leagues and won an RIBA award last week. 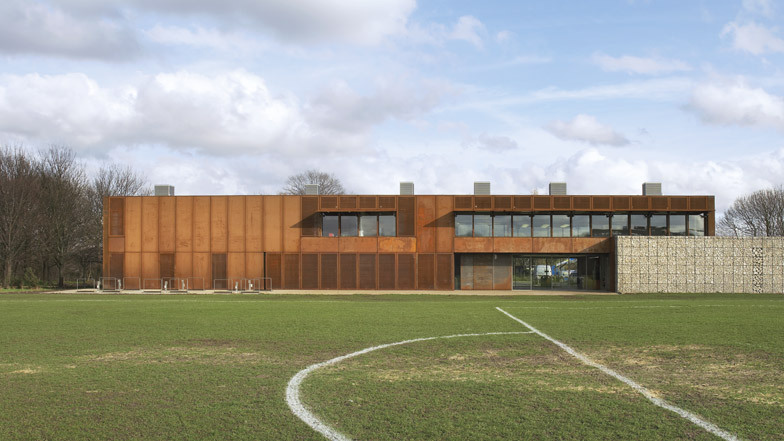 Completed last year, the Corten steel-clad centre contains changing rooms for teams competing on one of the 82 grass pitches at the park, as well as a cafe and toilets that can be used by spectators. Gabion walls line the sides of the two-storey building to encourage the growth of climbing plants, while the interior walls are constructed from exposed concrete blocks. Perforated hatches fold up from the facade to reveal windows, while a glazed entrance leads into a double-height reception that is overlooked by the cafe above. Stanton Williams were announced as the winners of three RIBA awards last week. The other two were for an art and design college campus and a botanic laboratory. Photography is by Hufton + Crow, apart from where otherwise stated. Hackney Marshes is a unique place. With its origins in ancient woodland and medieval common land, it remains a vast open space. It is a place set apart from the city by a boundary of trees and by the River Lea. Yet it also connects communities, being an important green space in a densely-populated area. In addition, as the London home of amateur Sunday League football, it draws people from across the capital. Stanton Williams was commissioned in 2008 to provide a new ‘Community Hub’ at the South Marsh. New changing rooms, plus facilities for spectators and the local community, will be housed in a welcoming, inclusive structure that recognises the special qualities of this place by bridging the boundary between the natural and artificial. It will connect not only with its immediate surroundings and the local community, but also the adjacent Olympic Park and the rest of the Lea Valley. The Marshes as they exist today are the product of a series of interventions in the natural environment, and in this respect they recall Cicero’s ‘second nature’ – a landscape shaped by human hands. Part of the ancient Waltham Forest, the Marshes had become common pasture by the Middle Ages. Early twentieth-century maps show the area as a recreation ground, and, after having been used as a dump for rubble during the Second World War, the site was levelled. The result is an open landscape of mown grass, punctuated by the regular rhythm of goalposts and edged by a seemingly more ‘natural’ boundary of woodland and the River Lea. Even here, though, natural and artificial and interlinked, for the river’s course has been straightened to minimise the risk of flooding. The Marshes have long been known as the home of grassroots amateur football: the site holds the record for the greatest number of pitches in one place, with over 900 matches played per year. However, by the start of the twenty-first century, the facilities provided for the hundreds of players who come with their supporters each week were in need of urgent overhaul. The London Borough of Hackney therefore developed an ambitious vision for the site, recognising its community value and its pivotal location adjacent to the Olympic Park. The authority sought a piece of high quality, well designed architecture that would recognise the unique qualities of the site, that would instil a sense of pride and ownership, and which could increase participation in sport. Education and community facilities were required in addition to those for players. The Hub has been developed after discussion with local stakeholders and consideration of the needs of users. It is firmly embedded within its landscape setting: it is not an ‘object’ at odds with the surrounding environment. It is located on the south-eastern boundary of the pitches, defining a threshold between the South Marsh and the car park beyond by plugging the gap between an avenue of trees to the south and a coppice to the north. The Hub’s overall massing minimises its impact on the site. Its height has been kept as low as possible, creating a pronounced horizontal emphasis that complements the open, flat nature of the site. The changing rooms are located at ground-floor level. A number of possible layouts were developed in order to arrive at the linear arrangement of the final structure. This option has the advantage that it avoids undue encroachment on the pitches, as would be the case for a more compact, back-to-back layout. The entrance has been located part-way along the structure to avoid excessively long corridors within. The community and spectators’ facilities, located at first-floor level, are placed at the northern end of the Hub, close to the tall trees of the coppice, into which they merge. Materials have been chosen for their ability to weather into the surrounding landscape and also for their durability, as there is a particular need to secure the building given the lack of natural surveillance that results from its isolated location. The ground floor envelope is treated as a landscaped wall. Gabion blocks, more usually associated with landscaping or civil engineering projects, are deployed in a fashion that recalls agricultural dry stone walls. They will weather well, are resistant to vandalism, and form a good structure for climbing plants. The result will be a living, ‘green wall’, through which light will filter into the changing rooms beyond. Elsewhere, weathered steel is used. This is an industrial material that recalls the manufacturing traditions of the Lea Valley and which, in its contrast with the more ‘natural’ landscaped wall of the lower level, recalls the combination of nature and artifice that gives the site its particular character. But it, too, has a natural quality. As a material which changes over time, weathered steel has a lively appearance and a rich textural finish. It will be deployed not only to clad the upper level of the structure, but also to form secure gates, louvres and shutters. Punched openings will allow light to enter by day and will also create controlled night-time views into the building, which will glow welcomingly as light emerges through the shutters and the gabion walls. Entering and using the building will celebrate the acts of arrival, changing and spectating. The main entrance opens into a double- height reception area with views through to the pitches beyond. A corridor to each side leads to the changing rooms. The ends of the corridors are glazed, not only bringing in natural light but also allowing further views out. The changing rooms themselves are configured so that they can be connected or separated as required. They have been designed to be suitable for use by groups of different ages and genders, with provision for disabled players. The principal finish is fairface concrete, left exposed in the interests of robustness and honesty. The café is visually connected to the entrance by the double-height reception area; panoramic views out provide a link to the pitches. External shading will prevent overheating whilst passive ventilators on the roof provide natural ventilation. The flexible teaching spaces, meanwhile, have an aspect toward the coppice and the River Lea, emphasising the rich local biodiversity. An acoustic screen can be folded back to create a larger space for conferences or seminars. The way in which the Hub seeks to reconcile the natural and the artificial through its massing, materials and location embodies a broader aim to synthesise sporting activity and the natural environment. Sports venues often demonstrate something of the tabula rasa in their approach, replacing natural materials with tarmac or artificial hard surfaces, and permeable boundaries with fences. As a result, playing becomes a solely physical experience. Instead, the Hub emphasises the ritualistic nature of sport. Within it, individuals are fused into teams, emerging onto the pitch to demonstrate their collective and individual skills, and to gain sensory and even spiritual stimulation from this rich location.